Swift enum is very powerful and versatile. It's a type in its own right, with support for methods and initializers, and the associate values feature allows us to use it in some nifty way. One example of the power of enum is the Optional type, which we've seen in detail in previous posts. Optional is defined as an enum with two cases. The case None represents the absence of value, while Some the presence of value. Some wraps the value which presence is representing in its associated value. A less known but equally powerful type which we can implement as an enum is Either. The Either type represents duality, a value that can either be of a type or another. Defined like that Either might not seem very practical, but here's a great usage for either: injecting extra cells in a table or collection view. 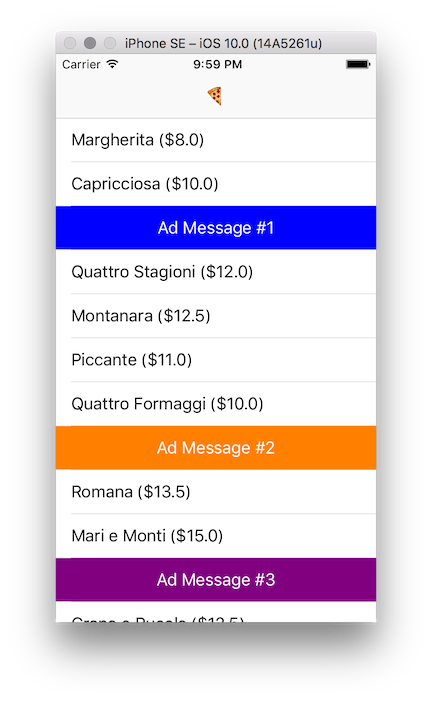 Sometimes we need to display lists in table or collection views with extra cells dedicated to call to action, or advertisement banners, which we'll let the user remove through in-app purchase (a dev still needs to pay the bills right?). We could do this by displaying a banner instead of the actual item for a given index path, and shifting the index used to fetch the next item we want to display from the array of data based on the number of banner cells that we've already displayed. Or we could use Either. Rather than an array of cell models we could feed the data source an array of Either<CellModel, BannerModel>. In the tableView(_:cellForRowAt:) method we could then get the item for the current index path and simply switch and behave accordingly to its type. This approach seems more solid to me. It doesn't rely on any math, making the code easier to digest, and I find the switch-case construct a very elegant and self explanatory way to describe behaviour. You can see the whole project from which the example code is taken on GitHub. I came in touch with Either by reading Maybe Haskell by Pat Brisbin. If I hadn't stepped outside of my comfort zone and decided to learn something quite different from the tools I use for my "day job" I might have never learnt about this type and I'd still be shifting array indexes. I'm saying this to encourage you to experiment an play around with different technologies, and see if some of the ideas you'll encounter can be brought back in your daily development.